How to get to the University of Paris Dauphine ? The University is located in the 16th arrondissement (north-west of Paris). If you are travelling from the Latin Quarter, we recommend that you travel by RER (Line C1 and C3 going towards Pontoise or Argenteuil). Get on the train at “Saint Michel-Notre Dame” (same entrance as the metro station called “Cluny la Sorbonne”) and off at “Avenue Foch”. The journey takes about 30 minutes. By metro: Porte Dauphine is the end station on line 2. 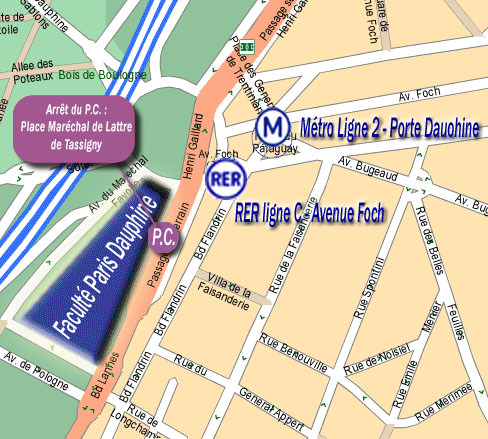 By bus: Take the “PC” from any of the “Portes de Paris” and get off at “Porte Dauphine”.